The general store is believed to have been constructed in the mid 1920’s. It was located in northern Wayne County at the intersection of U.S. 581 North and Polly Watson Crossroad. The store remained in operation until the early 1970’s. It was relocated to Old Waynesborough in 1995. The interior of this structure is furnished in a manner to replicate a country store. Located inside are several authentic merchandise and produce display cases. Other paraphernalia include old scales, meat and dry good wrapping paper dispensers, cash registers, a horse wagon and cart jack, wood stove, tobacco sticks, farm tools and implements, and a checkerboard game mounted on a barrel with bottle caps for board pieces. Numerous sundry items are on display including ladies hats, dry good containers, toiletry products, empty bottles and miscellaneous household supplies. The Wiggins House is a one-room residence that possesses a hearth for heating. It contained no electricity or indoor plumbing. Water was either brought to the house from a spring, a distance of approximately ½ mile, or was collected in rain barrels placed under the eaves. Four beds were originally located in the dwelling. What little privacy was available was accomplished through the erection of a curtain screen in one corner. To reduce the likelihood of fire, a kitchen was detached but was connected to the house by a covered walkway. The house was constructed by James W. Wiggins on land that is now part of Cliffs of the Neuse State Park. The exact age of the structure is unknown. Mr. Wiggins left his birthplace in 1894 to start a family. Portions of the house probably predate this time period because, as was the custom, parts of the home were purchased from adjoining farms and subsequently moved to the Wiggins homestead. 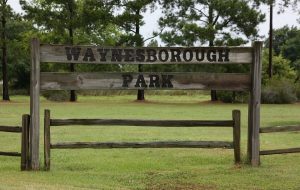 The building and outhouse were relocated to Old Waynesborough in 1991 and 1994 respectively. Dr. John Bryan Kennedy was born in 1845, the eldest of eleven children. He was tutored at home by his mother and eventually enrolled in the first class of the all male Wayne Institute and Normal College in Goldsboro. At the age of seventeen, his education was interrupted by the Civil War and he joined the Confederate Army. After the war, Dr. Kennedy renewed his educational pursuits and after attending several schools, graduated in 1870 with high honors from the University of Nashville in Tennessee, later to become Vanderbilt Medical School. Dr. Kennedy’s office was built in the 1905-1910 timeframe in the Grantham community in southwestern Wayne County and was relocated to Old Waynesborough in 1990. 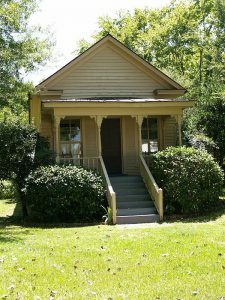 It is a replica of his first office that was constructed adjacent to his home sometime between 1870 and 1885. The office is comprised of three rooms, the first of which is a waiting room. This space currently contains a display table with four attached swing-out stools. The second room was used to conduct examinations. Presently housed in this area are two old wheelchairs, an examination table and a display case containing early medical instruments and medical books. The final room was used to care for patients overnight since hospitals were at a minimum. This third room contains a back door which permitted the removal of a deceased individual without having to transport the body through the entire office. Dr. Kennedy died on September 27, 1915. The Park Hill School was the third school of this name built ¼ mile east of Selah Christian Church in southwestern Wayne County. 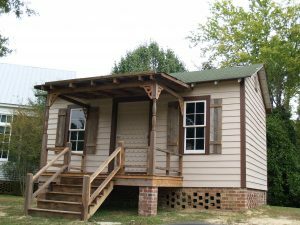 The building is indicative of the one-room rural school houses existing in the late 1800’s in eastern North Carolina. The first Park Hill School was constructed in 1880 and was named in honor of Mr. Park, the school’s first teacher. The second school was built in the late 1800’s. Due to overcrowding, this structure was subsequently sold and dismantled for lumber. The third school was erected in 1911 and was highlighted by a six-sided belfry with tall arched openings down each of its sides. The belfry was topped by a round, domed roof crowned by a lightning rod in the center. The original belfry was removed in 1940 due to storm damage. The school’s front porch opened into a foyer. To the left of the foyer was a small room which contained shelves for lunch pails and nails for coats and caps. A large wood-burning stove was located in the center of the classroom around which were placed recitation benches. Four tall paned windows were situated on the east side of the room. The west side was almost completely covered by a blackboard. Instruction was taught up to the 7th level. School was conducted from four to six months depending upon the amount of money raised to pay the teacher. At its opening in 1911, the third Park Hill School possessed a library containing 120 volumes. The school closed in 1925 and was moved to Old Waynesborough in 1990. The Neuse Odd Fellows Lodge No. 6, Independent Order of Odd Fellows was organized on August 16, 1845 at the settlement of Waynesborough. In October, 1847, the Neuse Lodge membership voted to move the lodge from Waynesborough to Goldsboro. The present Park Hill School was restored by the Grand Lodge of the Independent Order of the Odd Fellows and rests on marble slabs original to the Odd Fellows orphanage that was located in Herman Park in Goldsboro. The Park Hill School building currently is used by the Independent Order of the Odd Fellows as its state museum. 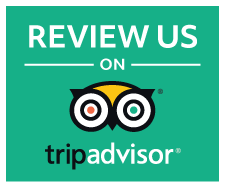 The museum contains ceremonial robes, memorabilia and a narrative on the history of the Odd Fellows. The Print Shop building was constructed in Pikeville, N.C. in the late 1920’s and was originally used to grade tobacco. It was relocated to Old Waynesborough in 2006 and was refurbished to represent a printing facility of the early 1900s. The Print Shop currently houses a 1910 Chandler and Price printing press. This machine utilizes block print. The Chandler and Price Company was founded in 1881 in Cleveland, Ohio. The company’s press design was not original but was based upon several patents which expired in 1850 and were previously owned by George P. Gordon. In 1884, Chandler and Price presses were built in two sizes and by year-end 300 units were produced. Chandler and Price presses were known to outlast all rivals due to the company’s concentration on incorporating quality in its equipment. In 1900, the building was moved to Charles Street and was converted to rental housing. It was relocated several more times, ultimately being placed at 207 East Spruce Street where it was restored by the Wayne County Historical Association. The front room of this structure contains a fireplace with mantel that was used for heating. Also housed within this room are two attorney work tables, a revolving book stand and a floor- to-ceiling bookcase made of rough-cut lumber. The Faircloth Law Office was brought to Old Waynesborough in 1990. William Turner Faircloth was born in 1829 and was licensed to practice law in North Carolina in 1856. He served as an Associate Justice of the North Carolina Supreme Court from 1874 to 1879. He was later appointed Chief Justice of the North Carolina Supreme Court in 1895 and served in this capacity until his death at age 70 in 1900. 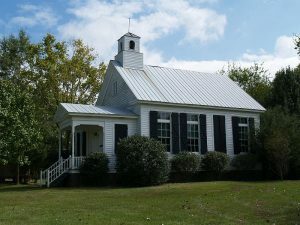 The Bethany Friends Meeting House, originally called the Falling Creek Friends Meeting House, was constructed in 1877 on property east of Cox’s Mill situated in western Wayne County. 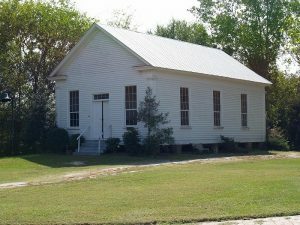 The first service conducted in this structure was held on September 22, 1879. The interior of the meeting house contained a wood-burning stove. Kerosene lamps hung from the ceiling and on brackets placed between the long windows. A “facing bench” looking back at the congregation was located in the front of the room for the leaders and three rows of benches provided seating for the membership. A name change to the Bethany Friends Meeting House was approved on July 26, 1879. Due to decreased membership, in 1953 regular meetings were discontinued at this facility. 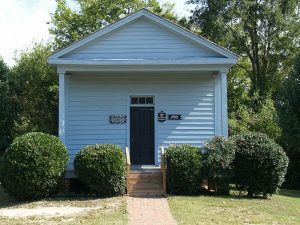 In late 1970, the meeting house was declared no longer viable by the North Carolina Yearly Meeting of Friends. As a result, the building was abandoned and was subsequently vandalized in 1980. Today only one original ceiling lamp and window lamp remains. A long pew, two short benches, a small table and a cabinet have been recovered and are currently housed in the Bethany facility. Many of the windows in this building still contain original glass panes. 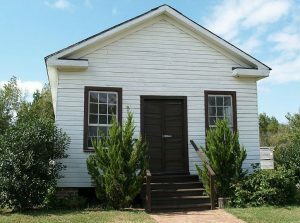 When the Neuse Friends Meeting House burned in 1990, Bethany became the oldest intact meeting house in Wayne County. At the entrance of the Bethany Friends Meeting House is a map denoting the locations of the 13 meeting houses that were established in Wayne County, along with their founding and closure dates, if applicable. The Bethany Friends Meeting House is available for rent to conduct wedding services. Built around 1890 in southeastern Wayne County in the vicinity of Casey Mill Road and Emmaus Church Road, this building was originally a one-room school where classes were taught by Mr. Roberts’ sister. The school was eventually converted to a Quaker meeting house. On November 30, 1892, John R. Roberts and his wife, Edna, deeded the structure and land to the Trustees of Public School Committee No. 64. The facility functioned again as a one-room school that housed grades one through six. The school operated until January 15, 1926. 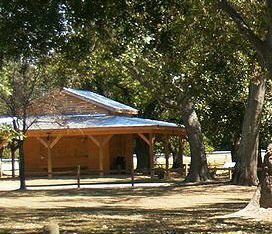 At that time, the property and building were deeded to the Trustees of the Primitive Baptist Church, Gum Pond. This church operated until 1950 and soon thereafter became inactive. In 1994, the building was purchased by the Wayne County Historical Association and was ultimately relocated to Old Waynesborough in 1999. For display purposes, the John R. Roberts School is presented in its original scheme as a one-room school house. A group photograph of the students enrolled in the school in 1921 hangs on the rear wall. The Salem Grange #327 was chartered as an organization in 1874. The Pomona Grange building was constructed in 1890 along Salem Church Road in northwestern Wayne County. 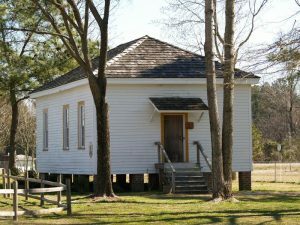 It is believed that this structure originally functioned both as a two-room school house and a Grange hall. 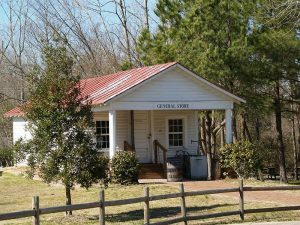 The Pomona Grange facility was converted to a community building in the early 1900’s when, under the leadership of Governor Charles B. Aycock, the State of North Carolina constructed several rural schools. The Salem Grange ceased to exist in 1902 but was reorganized and revived in 1929. Vandals set fire to the front left corner of the Pomona Grange building in the mid 1980’s. The edifice was relocated to Old Waynesborough in 1997 and was placed on brick piers in the same manner as it stood at its original location. After its relocation, remodeling activities were undertaken to the floor and interior walls. 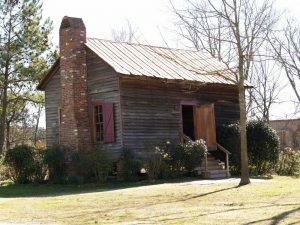 The original tin roof was replaced with cedar shingles. Today, the Pomona Grange building functions as a museum, housing farm implements and historical documents of the State Grange. This cemetery is the last remaining vestige of the original Waynesborough settlement. Built by the Churchill and Cogdell families, the cemetery contains six identifiable grave sites marked by head and foot stones. The grave plots are surrounded by a wrought iron fence, a section of which is embedded in a large tree. 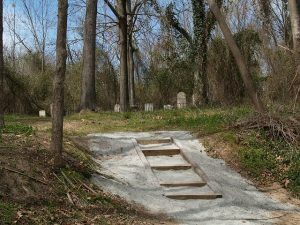 The earliest grave site is dated 1846 and the last person to be buried there was in 1904. This structure was located on a Wayne County farm and was brought to Old Waynesborough in 1990. 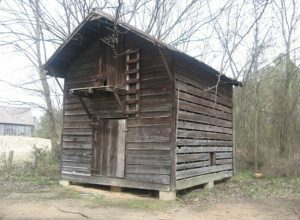 It is an excellent example of a late 1800’s hay barn or corn crib commonly found in eastern North Carolina. It was originally utilized to store winter food, primarily hay and ears of corn, for farm animals. Separations exist in the exterior walls in order to permit the circulation of air to facilitate the drying process of the materials contained within. This building is a replica of a blacksmith facility that would have existed during the 1800’s. The shop is constructed using native cypress wood. The building’s floor is paved with old brick. The interior contains a forge, anvil, quenching tub, leg vise, drill press and a variety of blacksmith tools. A ten foot wide lean-to is attached to each exterior wall. The blacksmith shop is a functional exhibit and demonstrations can be scheduled for group tours.